"A sweet yet cutting exploration of the bonds of friendship in competitive New York City." "Alam captures something truthful and essential about the push-pull of friendship,"
Read Rumaan Alam's story "A Certainty". 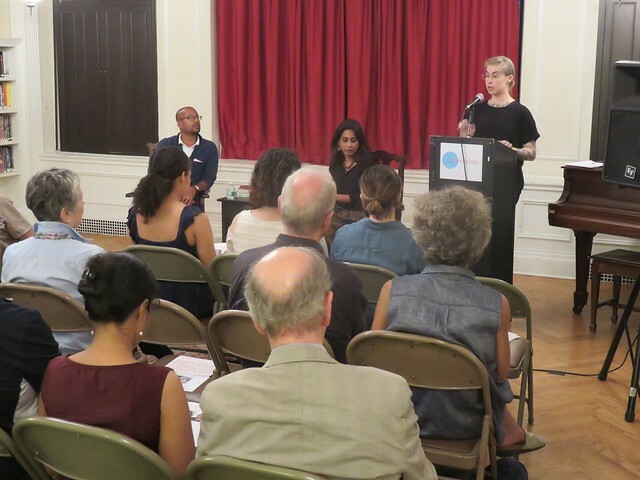 We celebrated the launch of the Graywolf Press edition of Anuradha Roy’s Man Booker longlisted novel Sleeping on Jupiter. Roy is author of An Atlas of Impossible Longing (2008) and The Folded Earth (2011), and recipient of the 2016 DSC Prize for South Asian Literature. She was joined in conversation by Rumaan Alam, author of Rich and Pretty, which was one of this summer’s most hotly anticipated titles. A Man Booker Prize long-listed novel about violence, love, and religion in modern India. On a train bound for the seaside town of Jarmuli, known for its temples, three elderly women meet a young documentary filmmaker named Nomi, whose braided hair, tattoos, and foreign air set her apart. At a brief stop en route, the women are unprepared to witness a sudden assault on Nomi that leaves her stranded as the train pulls away. Later in Jarmuli, among pilgrims, priests, and ashrams, the women disembark only to find that Nomi has managed to arrive on her own. What is someone like her, clearly not a worshipper, doing in this remote place? Over the next five days, the women live out their long-planned dream of a holiday together; their temple guide pursues a forbidden love; and Nomi is joined by a photographer to scout locations for a documentary. As their lives overlap and collide, Nomi’s past comes into focus, and the serene surface of the town is punctured by violence and abuse as Jarmuli is revealed as a place with a long, dark history that transforms all who encounter it. A haunting, vibrant novel long-listed for the Man Booker Prize and the DSC Prize for South Asian Literature, and short-listed for the Hindu Literary Prize, Sleeping on Jupiter is a brilliantly told story of contemporary India from an internationally acclaimed writer. This irresistible debut, set in contemporary New York, provides a sharp, insightful look into how the relationship between two best friends changes when they are no longer coming of age but learning how to live adult lives. Once, Sarah and Lauren were inseparable; for a long a time now, they’ve been apart. Can two women who rarely see one other, selectively share secrets, and lead different lives still call themselves best friends? Is it their abiding connection—or just force of habit—that keeps them together. Anuradha Roy is an award-winning Indian novelist, journalist and editor. Roy grew up mainly in Hyderabad, India, where she was educated at Nasr School. She studied English Literature at Presidency College, then affiliated with the University of Calcutta and at the University of Cambridge. She is the co-founder of Permanent Black, a publishing house started in 2000. Her first novel, An Atlas of Impossible Longing, has been translated into fifteen languages across the world. It was named by World Literature Today as one of the "60 Essential English Language Works of Modern Indian Literature". Her second novel, The Folded Earth, won the Economist Crossword Prize and is widely translated. Sleeping on Jupiter, her third novel, won the DSC Prize for South Asian Literature and was nominated for the Man Booker Prize. Her essays and reviews have appeared in newspapers in India, the US and Britain.